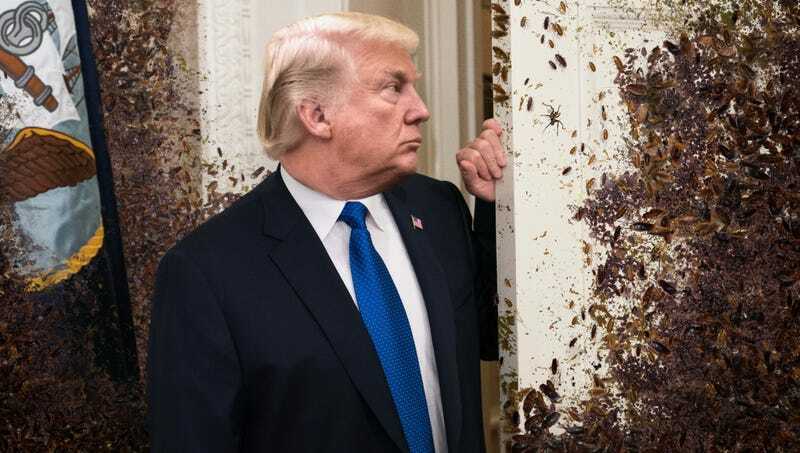 WASHINGTON—Saying that its presence had been a valuable source of comfort at a difficult time, President Trump reportedly told the White House cockroach infestation on Friday that it alone truly understood him. “Things are so tough right now, and it’s nice to know someone out there has so much in common with me, really gets what I’m feeling,” said Trump to the skittering mass of insects that coated the walls, furniture, and floor of the Oval Office and feasted on a rotting hamburger in a wastepaper basket. “We just have a bond, and it gives me strength to know someone really accepts me as I am. Heck, sometimes I think you might even know me better than I know myself.” At press time, an emotional Trump had scooped up a teeming armful of cockroaches to his chest for a long, tender hug.